(CN) – The key to understanding how ancient fish species diversified may be to look in shallow seas before moving on to other habitats, a team of scientists concluded in a new study. This upsets previous theories that fish diversified in coral reefs. Though fossil records are scant, scientists believe fish appeared on the planet around 480 million years ago. Many more fossils from around 420 million years ago have been found, leading scientists to ask about what caused the increased biodiversity. Fish are believed to be the first animals with a spinal column. A new study published this week in the journal Science suggests fish largely evolved in shallow lagoons, areas called intertidal zones. This challenges previous understandings of where fish diversified. “Our work shows that almost every major vertebrate division, from the earliest armored jawless fish all the way up through sharks and our own ancestors, all started out right near the beach, far inshore of the reef,” said paleobiologist Lauren Sallan from the University of Pennsylvania. While the exact location on Earth where vertebrates evolved is a hotly contested issue, the new study undermines the previous belief that invertebrates diversified around coral reefs. 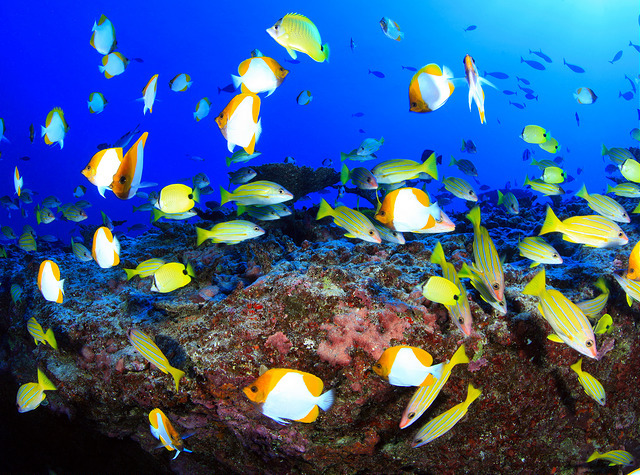 Reefs, which are threatened worldwide, are seen as important for fish biodiversity. But the research suggests the shallows are where fish developed. The team’s research helps explain why there have been so few intact fish fossils. Shallow ocean waves broke the fossils into small fragments, and many types of fish evolved into either freshwater fish or land-dwelling animals. The researchers put together a database of more than 2,700 early records for early jawed and jawless fish that lived between 480 and 360 million years ago. They used mathematical modeling to reconstruct missing information about the fish habitat. Certain fish adapted in the shallow waters, while others developed traits that made them better suited as bottom-dwelling or open ocean fish. Given the environmental impact of coral reefs dying across the world, the scientists hope to see a similar study about living vertebrates to determine if “these shallow waters are still the biological pump that is feeding the reef,” as Sallan says. If so, the scientists say there may be some hope that shallow seas could continue help diversifying populations. The team was funded by the University of Pennsylvania and the University of Birmingham.